Fifty years ago, the Woodstock Music Festival defined a generation. Yet, there was much more than peace and love driving that long weekend the summer of 1969. 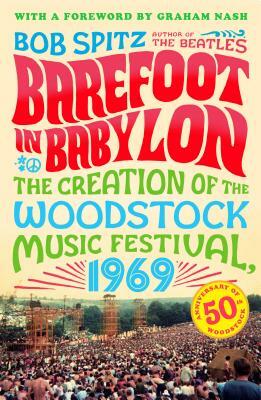 In Barefoot in Babylon, journalist and New York Times bestselling author Bob Spitz gives readers a behind-the-scenes look at the making of Woodstock, from its inception and the incredible musicians that performed to its scandals and the darker side of the peace movement. With a new introduction, as well as maps, set lists, and a breakdown of all the personalities involved, Barefoot in Babylon is a must-read for anyone who was there—or wishes they were. Bob Spitz is a journalist and author with wide experience in the music industry. He has managed Bruce Springsteen and Elton John. He is the New York Times bestselling author of Barefoot in Babylon: The Creation of the Woodstock Music Festival, 1969; Dylan: A Biography; Dearie: The Remarkable Life of Julia Child; and The Beatles: The Biography.